A complete lower consists of a lower receiver, trigger, magazine release, bolt release, safety, trigger guard and associated pins and springs. 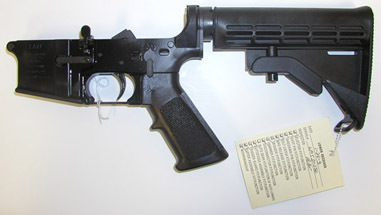 It can be considered a complete lower whether or not it includes a buttstock. There's a few compelling reasons to purchase a complete lower. First, like most mechanical things its more cost effective to buy it with the parts installed then to buy individual parts. Its certainly an easier approach if your lacking in mechanical skills, tools or both. Lastly you are almost certain all the parts will work and there should be no issues pertaining to the fitting and functioning of the individual components. The down side with most complete lowers the manufacturers, builders and sellers typically will offer the lowers in specific configurations with no option for purchasing the lower with the parts of your choosing. Basically what you see is what you get and if your building a mil spec AR that's fine. There are exceptions though. The down side is you may be wasting money on parts you'll never use if you plan on upgrading items such as your trigger. Lewis Machine Tool is one of the companies who manufactures lowers for use and sale by others. LMT also has probably the biggest selection, 21 variations to choose from. There's ambidextrous safeties, various triggers, custom marking, colors and stock configurations available. These are premium units. Specs : Forged and machined 7075-T6 aluminum. Double Star's offerings are similar to DPMS. High strength, hammer forged receiver is CNC precision machined and hard coat anodized black for a long lasting, durable finish. Extra reinforcement around the front pivot pin, reinforcing ridge over the buffer tube area and a full fence around the magazine catch button ensure that these lowers are built for a lifetime of heavy-duty use. Includes a radiused metal trigger guard and magazine catch button. Safe and fire is engraved on both sides for guns with ambi safeties. Includes a mil-spec trigger group and pistol grip and features an injection molded, synthetic, four-position collapsible stock so you can select the best length of pull for your shooting needs, and includes a fixed sling swivel. Made in USA with mil-spec parts only. 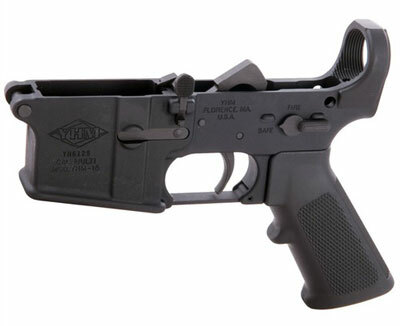 CMMG allows you to customize your lower directly on their web site. They offer a several different triggers, hammers, pistol grips, buffers, buttstocks and many other options. Its real easy to spend over $800 on one of their lowers when completely tricked out verus their standard mil spec offering which is about $250. Heres the info on the standard CMMG complete lower. Rugged, semi-auto receiver made from a high-quality forging is built to handle the hard use and abuse of tactical and competitive shooting. Forged from 7075 T6 aluminum alloy, for an extra margin of strength and rigidity over standard 6061 alloy receivers, before precision machining to final mil-spec dimensions. Hardcoat anodized for added strength, then Teflon® coated for outstanding resistance to scuffs, scratches, surface abrasion, and discoloration from gun oils. Available as a Stripped lower receiver ready for a full custom build, or Complete and fully assembled including pistol grip and trigger group, with a choice of ambi safety selector or standard, left-side mounted selector. CMMG’s engineers designed custom fixtures for final grinding of 10 separate contact surfaces on the trigger, disconnector, and hammer to ensure a crisp, precise release. Proprietary bronze bushings on trigger and hammer pins reduce friction for a consistent, ultra-smooth pull and exceptionally fast locktime. Rounded, low-mass hammer further speeds locktime and reduces wear on contact surfaces. 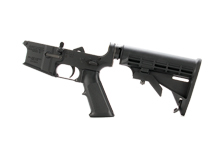 Trigger is function tested before lower leaves factory; compatible with .22 LR conversions. Receiver also includes bolt release lever, mag release button, aluminum triggerguard, and A2 pistol grip already installed. A2-style pistol grip of nearly indestructible polymer has molded-in checkering for a secure grip and is impervious to humidity, temperature extremes, and most cleaning chemicals and lubricants. SPECS: Receiver - Forged 7075 T6 aluminum, hardcoat anodized, Teflon coated, matte black. ".223/5.56mm" stamped on side of magwell. 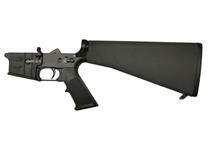 Pistol Grip - High-impact polymer, black. .154" hammer/trigger pin holes. .250" pivot pin holes. The Yankee Hill Complete Lower Receiver with Parts Kit is a rugged accessory machined 100-percent in house from forged 7075 –T6 aluminum. It is crafted to military specifications for a superior fit and finish. 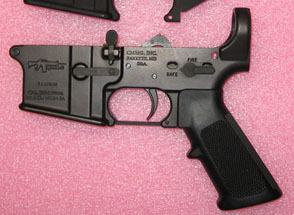 This lower receiver also features oversized magazine well chamfers for easier magazine changes. It comes pre-assembled with a complete lower parts kit installed.